, one of our early printers, is said by Bale to have been a citizen of London, and by Pits a native of that city. 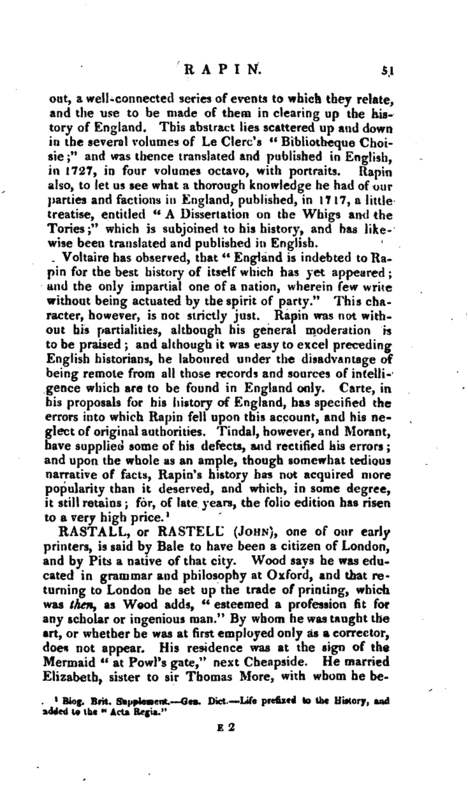 Wood says he was educated in grammar and philosophy at Oxford, and that returning to London he set up the trade of printing, which was then, as Wood adds, “esteemed a profession fit for any scholar or ingenious man.” By whom he was taught the art, or whether he was at first employed only as a corrector, does not appear. His residence was at the sign of the Mermaid “at Fowl’s gate,” next Cheapside. He married Elizabeth, sister to sir Thomas More, with whom he | became intimate, according to Wood, by his piety and learning. Bale and Pits assign different causes for this intimacy; the one, because he was a bold champion for popery, which the other terms his great zeal for the glory of God. Herbert thinks it was most likely that he was at first introduced to his acquaintance by means of printing sir Thomas’s “Dialogues,” and that his acquaintance was afterwards cemented into friendship, as was natural, by their mutual principles and opinions. The date, therefore, of this acquaintance may be 1528 or 1529. 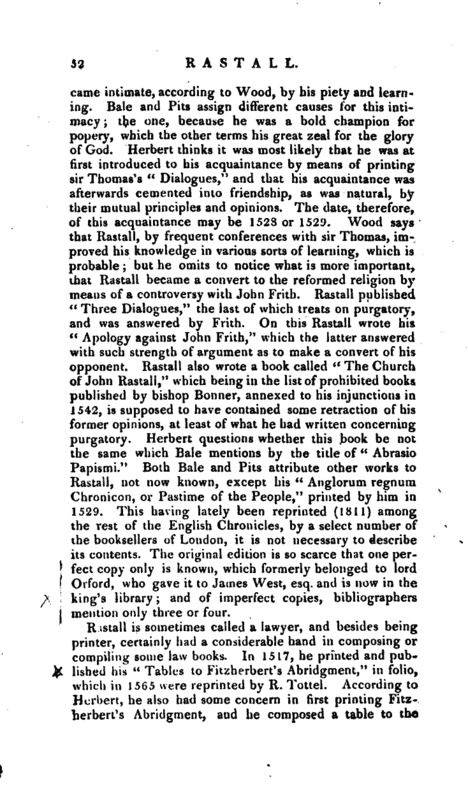 Wood says that Rastall, by frequent conferences with sir Thomas, improved his knowledge in various sorts of learning, which is probable; but he omits to notice what is more important, that Rastall became a convert to the reformed religion by means of a controversy with John Frith. Rastall published “Three Dialogues,” the last of which treats on purgatory, and was answered by Frith. On this Rastall wrote his “Apology against John Frith,” which the latter answered with such strength of argument as to make a convert of his opponent. 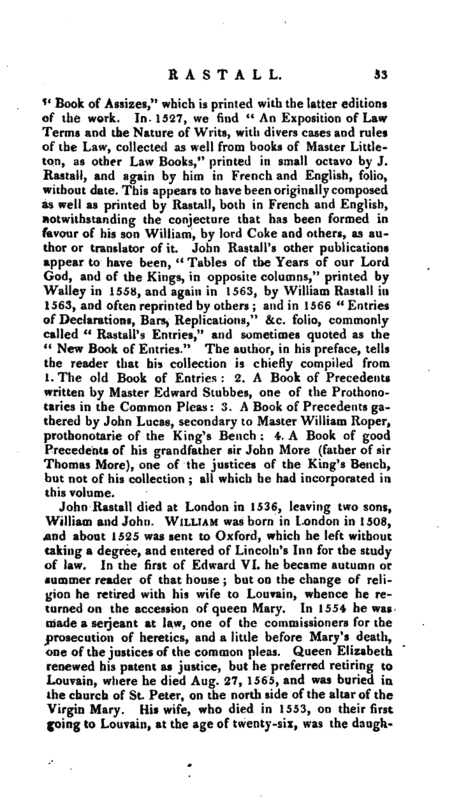 Rastall also wrote a book called “The Church of John Rastall,” which being in the list of prohibited books published by bishop Bonner, annexed to his injunctions in 1542, is supposed to have contained some retraction of his former opinions, at least of what he had written concerning purgatory. Herbert questions whether this book be not the same which Bale mentions by the title of “Abrasio Papismi.” Both Bale and Pits attribute other works to Rastall, not now known, except his “Anglorum regnum Chronicon, or Pastime of the People,” printed by him in 1529. This having lately been reprinted (1B11) among the rest of the English Chronicles, by a select number of the booksellers of London, it is not necessary to describe its contents. The original edition is so scarce that one perfect copy only is known, which formerly belonged to lord Orford, who gave it to James West, esq. and is now in the king’s library; and of imperfect copies, bibliographers mention only three or four. Rastall is sometimes called a lawyer, and besides being printer, certainly had a considerable hand in composing or compiling some law books. In 1517, he printed and published his “Tables to Fitzherbert’s Abridgment,” in folio, which in 1565 were reprinted by R. Tottel. According to Herbert, he also had some concern in first printing Fitzherbert’s Abridgment, and he composed a table to the | “Book of Assizes,” which is printed with the latter editions of the work. In 1527, we find “An Exposition of Law Terms and the Nature of Writs, with divers cases and rules of the Law, collected as well from books of Master Littleton, as other Law Books,” printed in small octavo by J. Rastall, and again by him in French and English, folio, without date. This appears to have been originally composed as well as printed by Rastall, both in French and English, notwithstanding the conjecture that has been formed in favour of his son William, by lord Coke and others, as author or translator of it. John RastalPs other publications appear to have been, “Tables of the Years of our Lord God, and of the Kings, in opposite columns,” printed by Walley in 1558, and again in 1563, by William Rastail in 1563, and often reprinted by others; and in 1566 “Entries of Declarations, Bars, Replications,” &c. folio, commonly called “RastalPs Entries,” and sometimes quoted as the “New Book of Entries.” The author, in his preface, tells the reader that his collection is chiefly compiled from l.The old Book of Entries: 2. A Book of Precedents written by Master Edward Stubbes, one of the Prothonotaries in the Common Pleas: 3. A Book of Precedents gathered by John Lucas, secondary to Master William Roper, prothonotarie of the King’s Bench: 4. 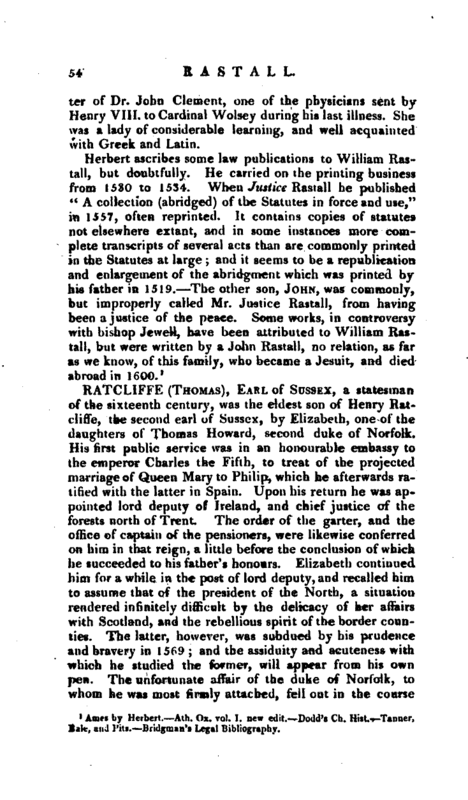 A Book of good Precedents of his grandfather sir John More (father of sir Thomas More), one of the justices of the King’s Bench, but not of his collection; all which he had incorporated in this volume. John Rastail died at London in 1536, leaving two sons, William and John. William was born in London in 1508, and about 1525 was sent to Oxford, which he left without taking a degree, and entered of Lincoln’s Inn for the study of law. In the first of Edward VI. he became autumn or summer reader of that house; but on the change of religion he retired with his wife to Louvain, whence he returned on the accession of queen Mary. In 1554 he was made a serjeant at law, one of the commissioners for the prosecution of heretics, and a little before Mary’s death, one of the justices of the common pleas. Queen Elizabeth renewed his patent as justice, but he preferred retiring to Louvain, where he died Aug. 27, 1565, and was buried in the church of St. Peter, on the north side of the altar of the Virgin Mary. His wife, who died in 1553, on their first going to Louvain, at the age of twenty-six, was the | daughter of Dr. John Clement, one of the physicians sent by Henry VIII. to Cardinal Wolsey during his last illness. She was a lady of considerable learning, and well acquainted with Greek and Latin. Ames by Herbert.- Alh. Ox. vo‘. I. n*w edit, Dodd’s Ch. Hist. Tanner. Bale, and Pils. Bridgatfta’f Legal Bibliography.